The 1 month I used these lenses went by so fast I was barely able to document it! 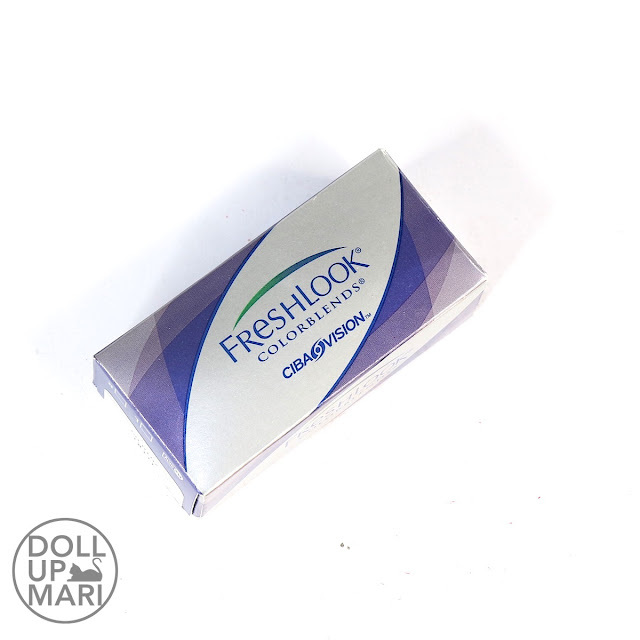 I received a sample of Freshlook Turquoise and I liked the effect on me, but I wanted to get more shades. I went to the Ideal Vision store near our house and took advantage of the Buy 3 pairs Get 1 pair promotion that they had at the time for this. So I got this, Sterling Grey, Amethyst, and a brown shade. So once again let me repeat, this is Grey, NOT STERLING GRAY. I will be slowly doing reviews for them as time goes, but for now, let me review this! These are my general observations for this product across all shades. I think I do not have perfect vision, but more or less I can pass wearing the plano (or no grade) lenses. The Obvious (because I have been asked these questions so many times): These lenses can be purchased in most malls and optical stores, and are typically NOT sold in drugstores. Kindly google or check your nearest optical store to see if they carry this. More or less every single mall nationwide should have a store that sells this. I am sorry if I just cannot answer every single query asking me as to where these lenses can be found. These are for 1 month use only AND STRICTLY 1 MONTH ONLY. When you open a pair, you can use it as many times as you wish up until the one month mark. These are reusable lenses (I.E. 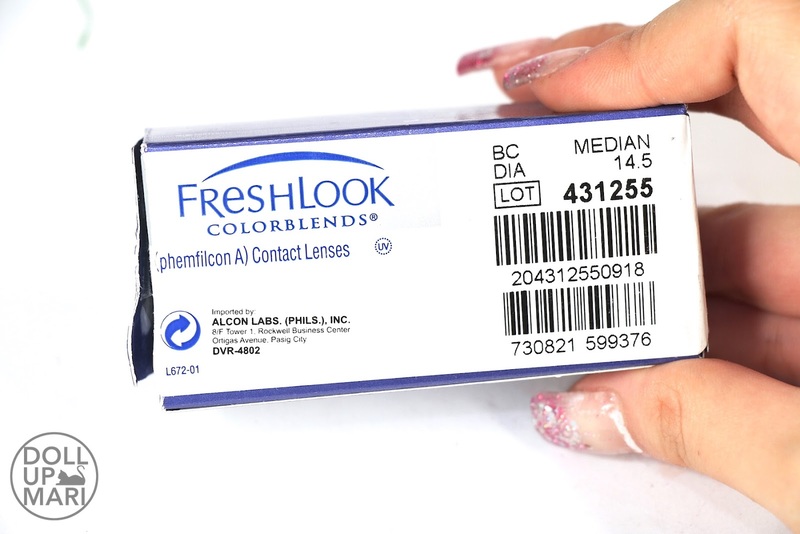 NOT THE 1 DAY DISPOSABLE ONES ALTHOUGH ALCON ALSO MAKES DISPOSABLE FRESHLOOK LENSES), BUT JUST FOR 1 MONTH. It does not matter whether you used this for a day or for 30 days-- the moment you open the seal, YOU HAVE EXACTLY 1 MONTH. The all caps is because I was improperly informed by Ideal Vision and was told that these lenses last for up to a quarter. I was wearing this pair at about 2 months since opening and it split inside my eye. No joke it split in half inside my eye. These lenses are made FOR JUST ONE MONTH AND ONE MONTH ALONE. Even if you bargain with yourself or your optometrist to allow you to extend, it will not stop these lenses from splitting in half if worn beyond the intended usage time. These lenses are not to be argued with. Another thing I get asked so often is about grade, so yes, these lenses have graded and non graded ones. If your eyes have uneven grade levels, you may raise this to your optometrist and buy one piece for each eye and pay the usual price for a pair. I also will apologize that I CANNOT prescribe your grade. I am not an optometrist. I get asked often what is a "good grade" to buy and this really just isn't the product where you guess it. These lenses are investments for yourself. You don't just hastily guess and order off the internet like the other brands. You get yourself checked and buy for your needs. This also leads me to the next question of if this is available online, as far as I know, it's not because these are medical grade lenses. These are made by Alcon, a leading medical company for eyes, and they are all about making people's lives better by getting them the professional help they need. If there are stores that are selling this online, I'd also be scared because they could be fake, improperly priced, expired, or tampered with. I would always recommend y'all to buy from physical stores because there's more accountability in general. And since I am on this topic, lemme clarify that contact lens solution IS NOT THE SAME as lubricant. Alcon has Opti-Free contact lens solution and Systane lubricant eye drops. The two serve different purposes. Opti-Free is the "soup" where you'll store your lenses in. You use it to clean, disinfect, and remove lipids from your lenses. Systane, on the other hand, is a brand of eye drops. Opti-Free is to lenses as Systane is to eyes. You cannot just randomly grab your Opti-Free bottle and squirt it on your eyes. On the flipside, soaking your lenses in Systane is also wrong and will cost you a lot of money. 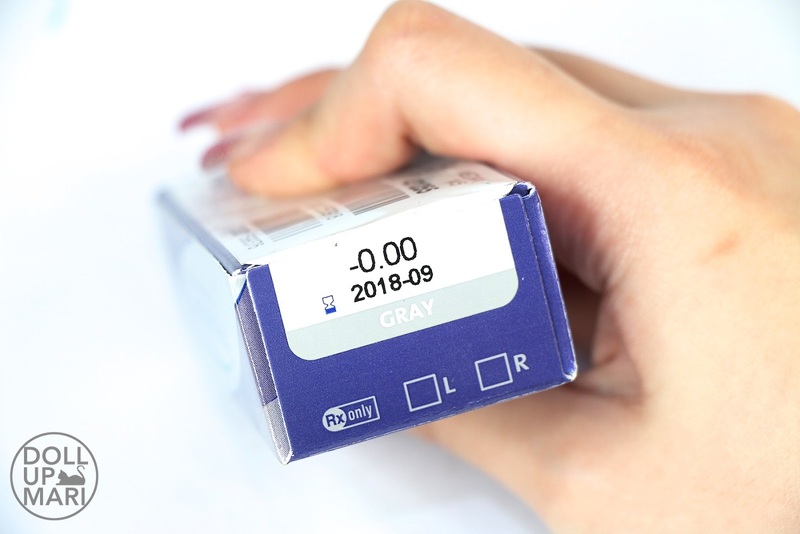 Opti-Free can be bought in optical shops, while Systane can be bought in optical shops and pharmacies. You can not use Systane if you don't feel problems with lenses (though most probably you'd need it too), but you cannot not use Opti-Free for your lenses. Soaking your lenses in any solution that is not contact lens solution may just cause them to degrade and expire prematurely. Okaaay so I hope that takes care of the FAQ section! 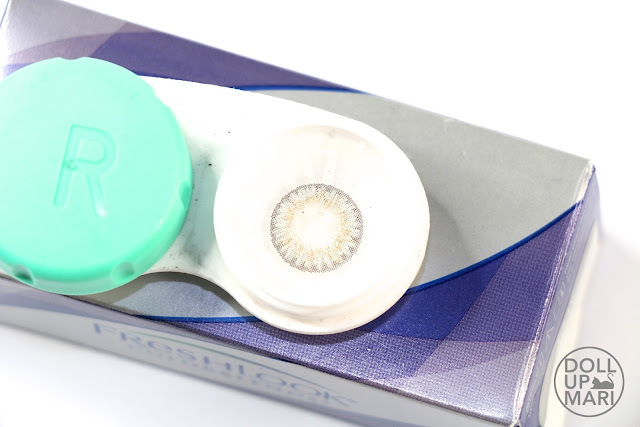 Comfort: These are very comfortable lenses considering these are not 1 day disposable lenses. These are thin and breathable enough that I can wear this for a whole day with no problems. They work a lot like disposable lenses, but the best thing is that they can be reused for a month. They don't dry my eyes out a lot. BUT let me clarify that all users in general have a lens break in period. I started wearing contact lenses in 2013, so I already am used to wearing them. If you are wearing this for the first time, it's ABSOLUTELY NORMAL to feel some discomfort and to tear up a bit more often. And you really may need eye drops when you use lenses. I attended an event with walk ins throwing their lenses away the moment they got them on and taking out their frustrations on the promo girls; I was shaking my head. Regardless of what lenses you wear, your first encounters with wearing lenses will be a little uncomfortable. It takes time to get used to them on, and it takes some time to get used to getting them on and off. It's my personal opinion that these lenses are comfortable, but I speak with 4 years of experiences of trying out all sorts of Korean and Japanese lenses. Each person's experiences and journeys will be different. Always be in contact with your optometrist in order for you to find out what counts as a normal break in period and what counts as an actual problem. Beauty Effect: There is a reason why Freshlook is the go-to celebrity lens. It's really just so natural that it looks like changing your eye color. I feel that this is set apart from plenty of circle lenses commonly sold online nowadays because this doesn't have a distracting black rim. Yeah I know. I used to be soooo obsessed with the black rim but I got tired of them because unless you're going for plain black circle lenses, the black rims make your look artificial. I like that these don't have those rims, and instead are just very beautifully strategized pigments that accurately emulate the look of a real iris. The diameter of the actual colored part of the lenses is not too wide unlike many circle lenses, so the overall effect is more natural. It feels more genuine and authentic in real life. Plenty of wide diameter lenses look good in photos but may be over the top in real life. I've found myself being able to sport these lenses and carry on my usual errands because they're not artificially conspicuous. After trying several shades from the Alcon family, I really get what they mean that each shade has such a profound effect on one's overall look. 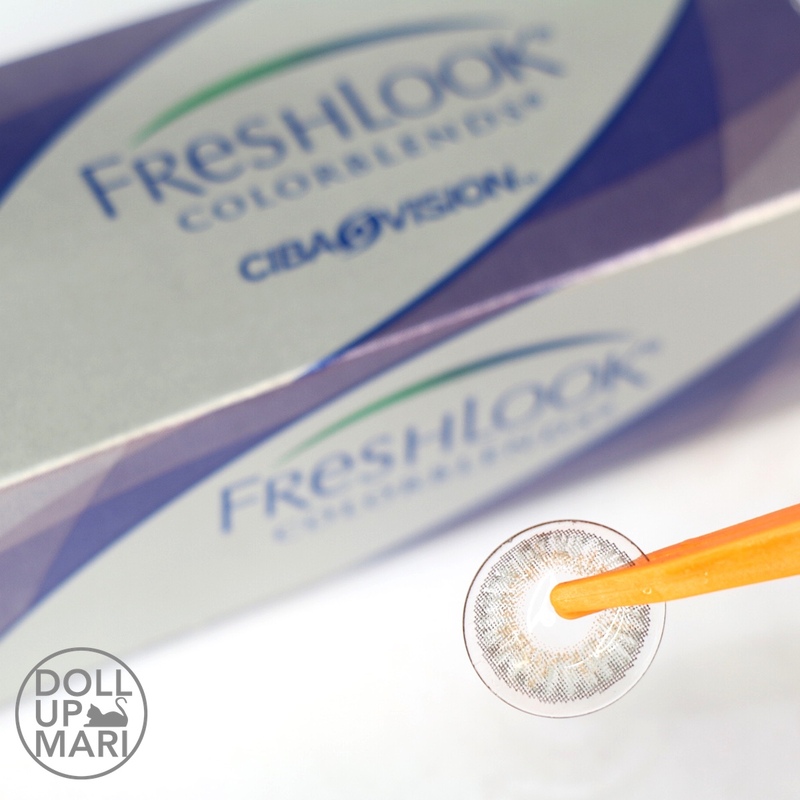 You can wear lenses from this same brand, but in a different shade, and see drastically different results. They create subtle and strong shades, meaning some shades are meant to give a bold transformation while some shades will give a subtle enhancement. It's up to you to choose which shade to get. Value For Money: This is Php1195 for a 1-month lens. I know upfront that it's really pricey relative to the time frame that it can be used. But one thing I can say is that these lenses are usable for the whole period they are advertised to be usable. You see, lenses often start to go "bad" waaay before the advertised date. If you own 1-year lenses, they can start to feel sore to use in just 3-4 months. 2 week lenses can start to feel sore on the 5th day. This, thus far, never feels sore from day 1 to 30, and that's something I really like. So now that that's done, this is how the box looks like. There's the grade and the expiry date and the shade. And these are the list of subtle Freshlook shades. While these are the bold Freshlook shades. This is how the lenses look like against a white background. I cannot compare this with Sterling Gray yet as I haven't opened mine as of this writing. This is me before applying them on. And these are eye shots of me wearing these lenses. I would like to note that these are good on dark colored eyes and can manage to block the original eye color that I have. Ay wow! gaganda po ng mga contact lenses! totally blends sa eyes mo po na di sumasapaw ang kulay ng contact lense! Para pong totoo na kulay ng eyes mo madam! I like it! Lovely contact lenses and it suits you well po.